Eggs, elves and an evil bunny are the main players in puppetry company Les Antliaclastes’ Waltz of the Hommelettes, an imaginatively sinister but frustratingly slow take on selected Brothers Grimm fairytales. Well-designed visual detail is its forte, with the action taking place in and around a giant cuckoo clock, its mahogany doors and timepiece sliding open to reveal skittery goblin shenanigans involving shoemakers and a stolen baby. 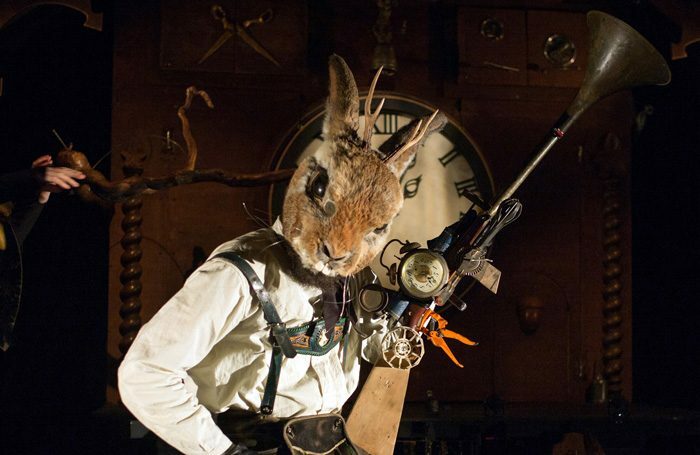 Tinny music-box waltzes and sentimental chanson combine with an eerie soundscape to heighten the sense of supernatural subversion, yet it’s the show’s most humanoid figure – in the form of a buck-toothed bunny in lederhosen brandishing a laser-focus blunderbuss – who proves most malign. While the elves help to free a trapped deer (a vignette rendered silently with an almost unbearable level of fragile pathos) and teach traumatic lessons in childminding to forgetful mothers, this Bavarian nightmare of a rabbit-man embodies environmental threat, whisking up the contents of a mother bird’s nest in a frying pan and scrambling time itself in his attempt to kill his avian target. The progress of a cuckoo-in-the-nest from scrawny hatchling to rambunctious raptor who chucks baby Jesus from his manger while the Virgin mother sweeps up is enjoyably weird (a UFO makes an appearance too) but the show suffers throughout from a rather ponderously leaden pace. The distended mask heads for the shoemaker and his wife, as well as the scuttling skeletal elf folk, are also an acquired aesthetic taste. It’s far from cutesy but nonetheless hard to love.